Greater Des Moines Botanic Garden, Des Moines riverwalk pedestrian bridge, Amana Colonies. Having gone an entire month without driving somewhere, we decided to turn our Iowan holiday visit into a mini road trip through the Hawkeye State. 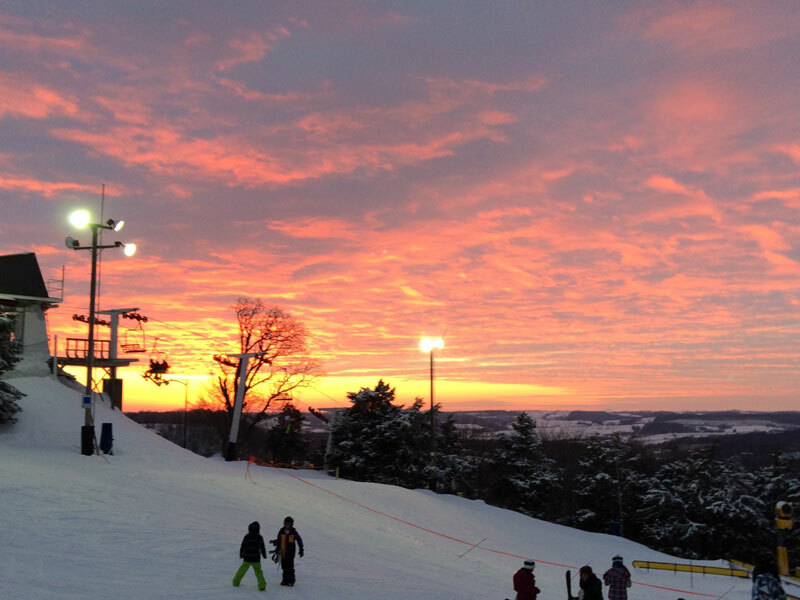 Starting in my home town of Dubuque, we spent an evening skiing at Sundown Mountain Resort. While “mountain” may be wishful thinking, most people are surprised to find out that the northeastern part of Iowa is actually very hilly. Hilly enough that Sundown’s nearly 500ft vertical drop is only surpassed by 2 resorts in the Midwest and those are located in far northern Wisconsin and Minnesota. Another bonus is that the entire resort is lit and you can ski until 9 or later depending on the day of the week. We headed three hours west to Des Moines the following morning. After enjoying a quick lunch at Manhattan Deli, our first stop was the Des Moines Art Center, which has an extensive permanent collection and focuses on contemporary art. The building is laid out in three wings, each designed by a prominent architect: Eliel Saarinen, I.M. Pei and Richard Meyer. Most surprising of all, the museum is free. I don’t recall another art museum of this quality that was completely free of charge in our travels. Iowa State Law Library inside the capitol. After that we headed to the gold-domed (and five-domed) Iowa State Capitol which rests on a hill overlooking downtown. We were expecting just a quick walk-through, but it turns out there is much more to see than expected. The building itself is incredibly ornate; one of the most impressive state capitols. 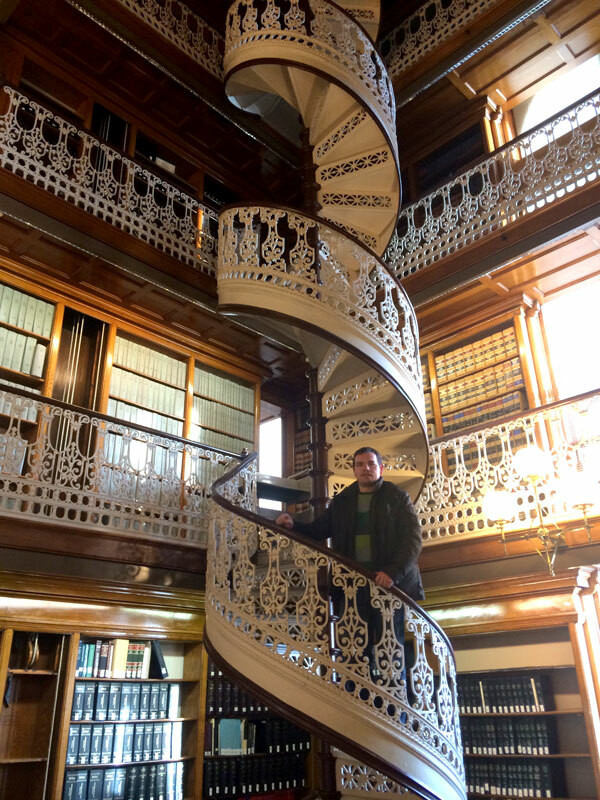 Displays in the main hallways tell stories of Iowa history and you are free to enter many rooms including the House and Senate chambers (when they’re not in session) and the incredible Law Library. We would have liked to climb the dome, but you have to join a guided tour and our afternoon was running short. We still wanted to head to the nearby Greater Des Moines Botanic Garden. The large, domed conservatory is filled with mostly tropical plants and has a show room and even waterfalls. It doesn’t take long to see, but it was a nice contrast from the chilly weather outside. Futur outdoor garden expansion plans look impressive, so that will help make it more than a brief stop. Before checking in to our hotel, we visited Confluence Brewing on the recommendation of a friend. Four sample-size pours cost only $5, but the beer was mostly milder than we prefer. It would be a great place to visit in the summer because right outside the back door is a major bike trail. We found a very reasonable deal at the Hyatt Place hotel, centrally located and within walking distance of all of downtown. Speaking of walking, we were slightly disappointed that we were the only pedestrians to be found, as everyone seems to drive everywhere in Des Moines (actually that’s true of most of the U.S.). It’s a strange feeling to walk down an empty street and then enter a restaurant or bar with hundreds of people inside. We had dinner at the recently-opened Exile Brewing Company, which has a great atmosphere, good beer and decent food and then headed to El Bait Shop and its amazing selection of beers. With 120 on tap and more than 150 bottled options, the menu is a little overwhelming at first, but the bartenders are helpful and will guide you to something you’ll like. Its sister location next door, the High Life Lounge even landed at number 10 on the barfinder.com survey of best bars in the country for 2013. Iowans are so nice, they’ll offer to take your photo without you even asking. The following morning we set off for Iowa City, 2 hours to the east to visit road trip buds Emily and Jake. We had some fantastic burgers at Short’s Burger & Shine (The location is a former shoe shine shop). Everything is locally sourced and the menu items are named after Iowa towns and counties. Most important of all, they have ten draft lines dedicated to pouring Iowa-brewed craft beers. The state has lately been climbing the ranks of craft breweries per capita, landing at number 14 in 2012. 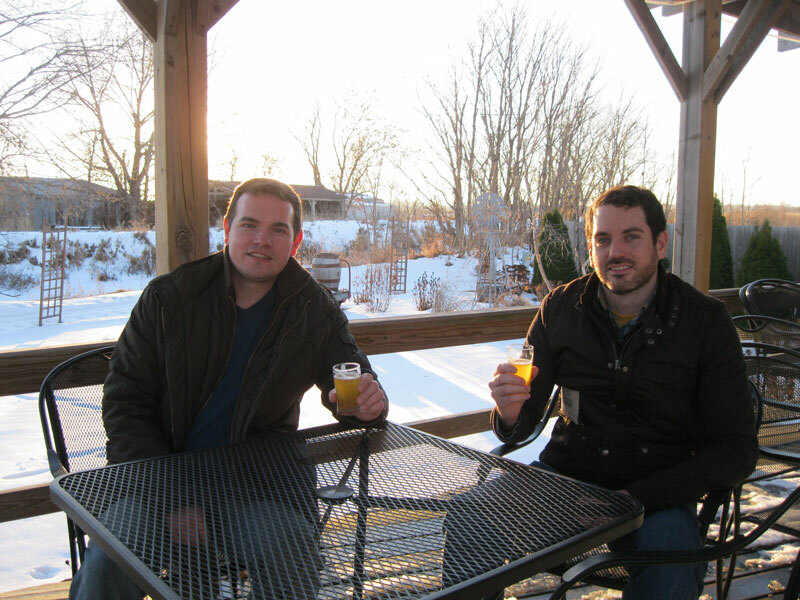 Another brewery that caught our attention ahead of time is Millstream Brewing in the town of Amana, 20 minutes from Iowa City. The Amana Colonies have an interesting history, and while we appreciate a little quaintness, it’s more like someplace you’d take your mom. Millstream however is fantastic. It is billed as Iowa’s oldest craft brewery and has many awards to prove the quality of their product. We did a five beer sampling and even enjoyed most of it outside on the patio in the 45 degree weather with some friendly natives. After that it was back to Coralville for dinner at yet another brewery, Backpocket. Their brick oven pizzas are the perfect compliment to their beers. A couple of our favorites were Pennywhistle and Slingshot. Before heading back to Chicago the following morning, Emily and Jake took us to Cedar Ridge vineyard/distillery just north of Iowa City for their tasty brunch buffet. Sampling in the tasting room is free and I approve their Clearheart gin for use in an aviation cocktail. If you’re counting, yes, that was four breweries and one winery/distillery in three days, but hey, someone needs to sample the goods. Speaking of which, a good place to find a lot of those Iowa beers is the locally iconic John’s Grocery. Also, if you’re a proud native like me (or just a fan) and in need of some great Iowa swag, check out Raygun. They make awesome tshirts and have real stores in Des Moines and Iowa City as well as their site. Overall I must say Iowa is a highly under-appreciated place for a long weekend getaway. 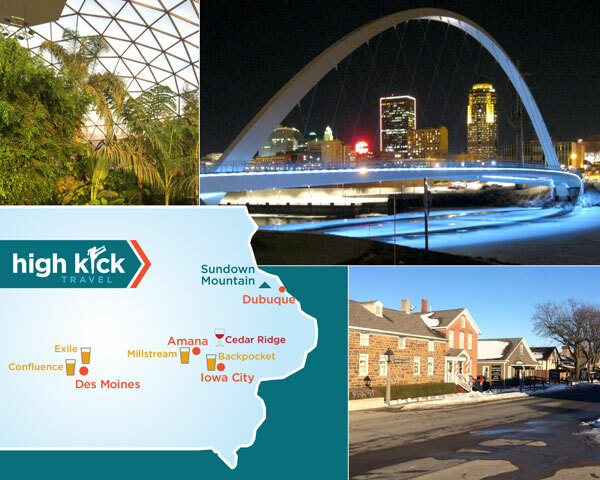 This entry was posted in Destinations and tagged Backpocket Brewing, Cedar Ridge Winery, Confluence Brewing, Des Moines Art Center, Exile Brewing, Iowa Road Trip, Iowa State Capitol, Millstream Brewing, Sundown Mountain. Bookmark the permalink.